KUALA LUMPUR - Four women from Singapore were among 14 people who died on Saturday (Dec 24) when a bus fell off the North-South Expressway near Muar in Johor, police and hospital authorities said. The Singaporeans who died have been identified as Ms Hamimah Mammu, Ms Faridah Tamron and her daughter, Ms Hazimah Mustafa. The fourth victim is Singapore permanent resident Au Poi Kiew. Sixteen others, including six other Singaporeans, were injured in the accident, which took place at Kampung Jayo, Jalan Kangkar-Senangar, Pagoh near Muar at around 4am. As of Sunday morning, all six Singaporeans injured in the crash had been discharged from the hospital and sent back to Singapore. The Alisan Golden Coach bus had departed from JB Sentral in Johor Baru and had been en route to Kuala Lumpur's Bandar Tasik Selatan Integrated Bus Terminal. The dead and injured were taken to the Sultanah Fatimah Specialist hospital in Muar. 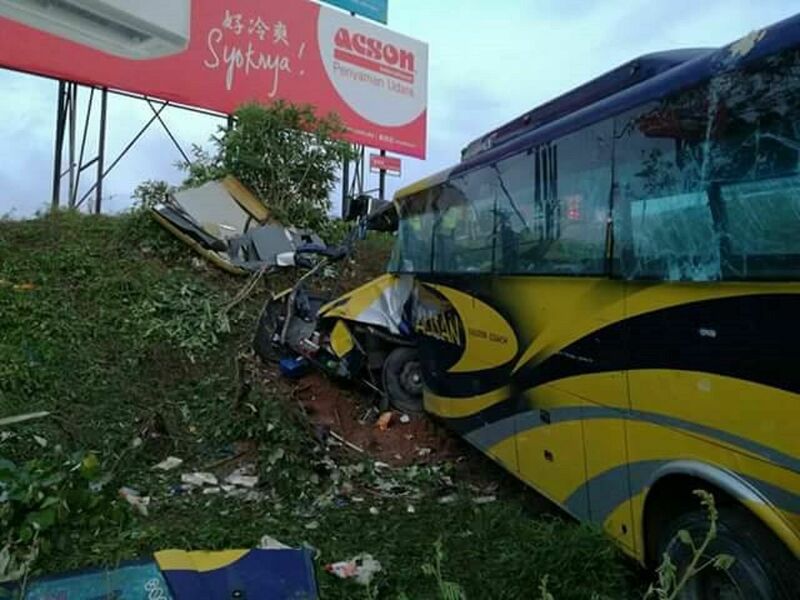 Malaysia's Land Public Transport Commission said it had suspended bus operator Goldstar Express (M) Sdn Bhd's licence with immediate effect to facilitate investigations into the crash, the New Straits Times (NST) reported. The police told The Straits Times that six men and eight women, including one child, were among those killed in the Christmas eve accident. Among the injured were seven Malaysians, six Singaporeans, two from Myanmar and one person whose nationality had yet to be verified, The Star reported. It reported Mr Azman as saying that the Singaporean group were made up of five men and one woman. A spokesman from Singapore's Ministry of Foreign Affairs said it was "saddened by the tragic bus accident". "The Singapore Consulate-General in Johor Bahru is in close contact with the Johor authorities. Our Consul-General and MFA officers are at the hospital in Muar to assist affected Singaporeans and their next-of-kin." According to The Star, the child on board was the bus driver's baby daughter. The report said the driver had brought along his daughter and wife on the trip, without the knowledge of the bus firm. Malaysia's Harian Metro newspaper said the bus driver had only joined a month ago. Police later said four of those injured have been discharged from hospital. 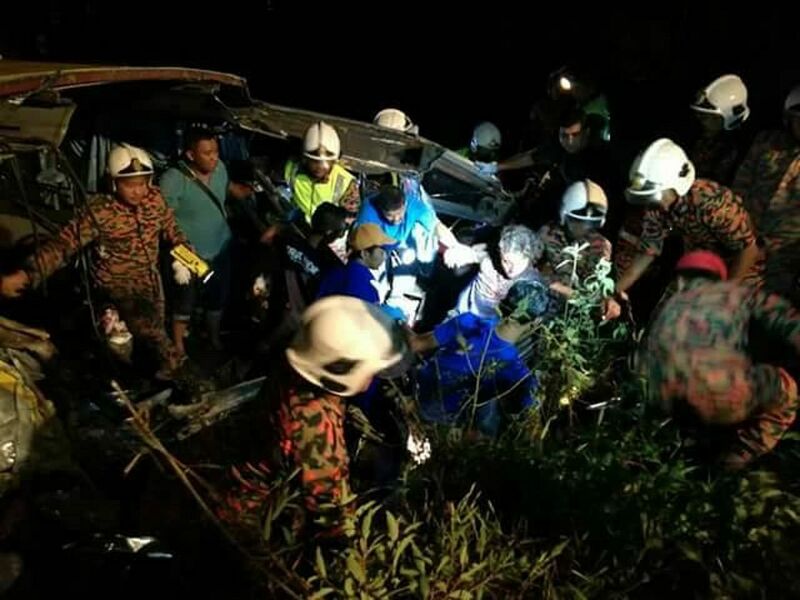 A team of 25 firemen from the Johor Fire and Rescue Department were deployed to the accident site after receiving a distress call at around 4am, The Star reported. The department's deputy director Mohd Yusof Mohd Gunnos was quoted by The Star as saying that initial investigations showed the road surface was in good condition and it was not raining when the incident happened. Mr Azman said the bus had been travelling at a high speed during the incident and the bus driver had lost control of the vehicle before it plunged into the cliff. Prime Minister Najib Razak expressed his condolences to the families of the victims of the crash. "Saddened by news of the bus tragedy in Johor which took 14 lives. My condolences to the victims' families, I pray that those who are injured will recover, God willing," Datuk Seri Najib wrote on Twitter. The Johor state government also offered its condolences, with State Health and Environment committee chairman Datuk Ayub Rahmat saying he had directed the authorities to investigate the cause of the tragic accident, Bernama reported. One of the survivors of the crash, Mr Mohamad Juhaify, 21, reportedly told his brother, Mohd Juzaimy, 37, that he had been sleeping in his seat at the back but was jolted awake when he was suddenly thrown to the front of the bus, the New Straits Times (NST) reported. Mr Mohd Juzaimy told the NST that his brother then woke up and realised that the passengers had all been thrown forward and had ended up in a pile at the front. In response to the accident, the Malaysian Institute of Road Safety (Miros) chairman Tan Sri Lee Lam Thye called on the government to set up the transportation safety board as an independent government investigative agency responsible for civil transportation accidents. The suggestion, he said, was key among a slate of recommendations set out in a report by an independent advisory panel to the Transport Ministry following a bus crash in Genting Highlands in 2013 that killed 37 people. He also said that Saturday's accident was likely to have been caused by human factors, such as drowsy driving and speeding - both of which are behind between 70 and 80 per cent of road accidents. The opposition Democratic Action Party's Johor chief Liew Chin Tong said the incident emphasised the need for the long-haul bus service industry to be shaken up, the Malay Mail Online reported. He also echoed the call by Miros for the advisory panel's recommendations - which include the installation of speed limiters for public service and goods vehicles - to be implemented. Muar police said the investigation into the incident was still ongoing.